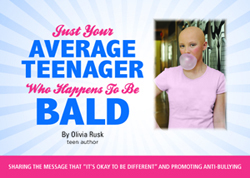 Olivia Rusk is 14 years old and totally bald due to the medical condition alopecia. When she was 8 years old, she shed her custom wig and bravely marched into her 3rd-grade class without hair. Since that day, Olivia has lived her life openly bald, without hats or wigs. Losing all of her hair twice since she was 2 years old could have devastated her, but instead it has given Olivia a powerful platform. With her brave stance and ability to share her story, Olivia launched a lecture program where she has inspired thousands of teens in schools, churches and other organizations throughout Central Indiana. Her messages are that “It’s Okay to be Different”, anti-bullying and teen suicide prevention. Olivia shows her teen audiences that “You Can Be Great”, whatever your challenges might be.